It’s a narrative we’ve seen time and time again: A young actor who rose to stardom on Disney Channel forays into music, determined to shed their kid-friendly image and become a capital-A Artist of their own making. Sometimes it works, sometimes it doesn’t — for every Demi and Selena, there’s an Anneliese Van Der Pol or Bridget Mendler, both one-time sitcom darlings whose fame fizzled during the uphill trek toward the Top 40. So for Laura Marano — whose four-year role on Disney’s Austin & Ally ended in January — the music-focused road she’s setting off on is a well-worn one. Luckily for her, she already has one big step up: Last year, she scored a record deal with Big Machine Records, the label that also reps a little artist by the name of Taylor Swift. Surely that means something, but Marano knows it won’t be easy, and she doesn’t pretend her fledgling music career will be facile or flawless. At age 20, Marano already has 15 years worth of acting credits to her name. Her mom is a former actress-turned-acting coach, and Marano and her older sister Vanessa (whom you might recognize as Bay fromSwitched at Birth or April from Gilmore Girls) got the show biz bug early on. Acting came first for Marano, but singing was always her plan. It lingered in the back of her head, fueling years’ worth of “amateur songwriting,” as she puts it, but she was incredibly insecure about her music. 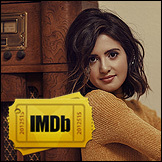 That is, until she booked the part of singer-songwriter Ally Dawson on Austin & Ally, forcing her out of her comfort zone and into a more music-centric spotlight. Austin & Ally’s four-season run ended in January, allowing Marano to make music her first priority. Her transition from Disney stardom to serious pop contender won’t happen overnight and it won’t lack commentary from skeptics who question her legitimacy. But she’s hellbent on not giving in to the temptation to radically change her image in an effort to “prove” herself. Marano has a young fanbase. She knows that, her team knows it, and she’s not looking to abandon them anytime soon. Rather than, say, pull a Zayn Malik and go directly from One Direction’s mostly prim hits to his sexually explicit solo offerings, she wants to acclimate her fans before bombarding them with maturity. Still, she admits she’s been “definitely overthinking” the best way to do that. If it seems like Marano’s overtly cautious about her next career steps, it’s only because she’s dead-set on holding the reigns herself (thus making her entirely accountable). It’s part of the reason why she gravitated toward Big Machine, a label that she says agreed to let her have the creative control she craved and to “be the boss of [her] sound.” The Nashville-based label boasts a roster of predominantly country artists, but the way Marano tells it, Taylor Swift’s Grammy-winning album 1989 made them open up avenues to pop artists like Marano — which was especially thrilling for a Swift superfan like her. Marano’s “ultimate” influence, however, is Pink, whom she considers a somewhat underrated performer (“Have you seen her perform? She literally does flips as she’s hitting high notes!”). Above all else, Marano points to Pink’s talents as a lyricist as her major source of inspiration. Ultimately, it’s exactly the kind of upbeat song you’d expect from Marano, who speaks with the enthusiasm of a camp counselor and whose optimism is contagious. It’s hard to imagine someone making the screen-to-stage transition easily, but she makes you believe she’ll pull it off.